What everybody fails to know is that the patio or french door can be an easy target for a would be thief. You would think that two doors fitted with a modern multipoint would be quite a challenge, but the simple fact is it isn't. In fact the use of multipoints usually found on UPVC, Aluminium and timber composite doors has made it easier not harder to gain entry into the home or business. The multipoint in the door is split down into three vital components. The multipoint itself consisting of different locking points is in fact just a one lever lock. Once the locking cyclinder the next component in the door is removed opening the door is pretty much a certainty. The third component are the handles. 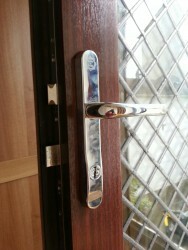 Most doors are fitted with cheap nickle handles and only some have better quality. So how is this possible. Quite easily actually. The key is to remove the locking cylinder. Most doors are only fitted with standard cylinders which are not by any means high security locks. The tools needed to break the lock and open the door are basic and the whole process could take less than a minute quite easily. The other considereration is lock fitting. Locks that protrude out of the door more than 5mm might as well have a big sign on them saying"easy target", because thats what they are. Doors with incorrectly fitted locks would only take seconds to bypass. The first option is replacing the budget handles with handles that have been secured by design and that have been security stamped. These type of handles have been strengthened to resist attack and as such protect the locking cylinder and thus stop the door from being opened. The andles can not be bent pulled back or hammered out of place and the only way to remove them is from the inside. The handles not only prevent access but look good too. The other option is to replace the standard locking cylinder with a quality snap safe lock. This type of lock is designed to resist the act of breaking or snapping the lock in order to try and gain access to a door. The lock a=has snap profiles and is fitted with a hardened core to prevent further snapping. Just because a lock has a kite mark stamped on it does not mean that it is break proof. What about Kite Marks on locks? A thief is not going to kneel at your door and pick your lock. They are not going to drill your lock out either. The majority of kite marked locks prevent these types of attack along with lock bumping. The majority of attacks are done by snapping. This way to a means takes little training and or practise and literally takes seconds to accomplish. Snapping locks is quite an easy task. You would think that it would be quite hard to snap a piece of metal but the locks come with a design flaw that is well known to police and locksmiths alike. The flaw aids the snapping process and makes it easy. So easy that a child could do it to break the lock in seconds. If you are concerned about this article and your door security get some free advise from a local locksmith know knows what they are talking about or speak to your local bobby.